When I was little, I learned a lot of Scripture through song, and the verses to the left are an example of that. 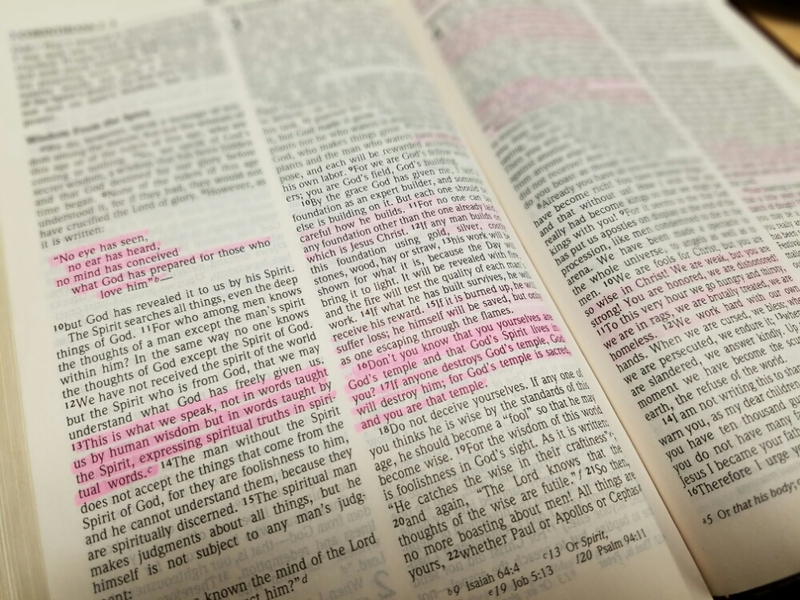 I do most of my private Bible study in my Amplified Bible (AMP), because it provides additional phases of meaning included in the original word, phrase, or clause of the original language and clarifying words or comments; I also like the English Standard Version (ESV, which is more of a word for word translation). But most of the Scripture I have memorized, is either in the King James (KJV) or New International (NIV), since that’s what I grew up with. Therefore, when I come across familiar verses such as these in my AMP Bible–I sing the song, lol–and take notice of the additional words used that I might gain greater insight into the text. Recently, I’ve noticed Facebook posts including Scripture, and then people stating their personal opinion regarding said Scripture. Basically, they attempt to void the Scripture, with their opinion. However, if something is found in the Word of God, it’s not opinion, it’s Truth. We have opinions, but God sets the standard. If our opinion goes against the Word, we’re in the wrong; and we’re being rebellious. But…but…the are no buts. As the Bible tells us, we’re not to be relying on our own understanding of how we think things should be, because God doesn’t think like us. It’s us who should be striving to see the world as He does! If the Bible says something that we don’t understand or agree with, then we should pray that God change our heart (and mind) and help us to see as He sees, or to help us be obedient in that area, even if/when we don’t understand. I guess what it comes down to is, are we confident that the Lord is good (perfect), and that His ways and plans are higher and greater than our own? Are we dependent upon Him for direction and revelation? Do we trust Him, fully, completely? If so, then we have to trust that what He says in His Word is true, whether we agree with it or not. Furthermore, sometimes we simply don’t agree with something because it’s being taken out of context. This is one reason why I say the Bible needs to be read in its entirety. You may find that in one book you’ll find something that you think contradicts another verse, but in reality it simply gives us greater understanding and insight into what God really meant. The God of the Old Testament is the same God in the New Testament, with the same love for humanity, but He’s also holy, righteous, sovereign, and oh-so-wise. So, let’s keep our eyes on the path ahead, and not turn to the right or left (Proverbs 4:25-27). Let’s remember that His Word is truth and our opinion, just that, our opinion. We don’t see the big picture as He does, but if we’re believers, the Holy Spirit can help us not to just see, but also to walk in obedience, trusting in the Lord every step of the way.